Bikini Seven Seas set, 49,90 Fr. With us, you will find high quality bikinis of the brand Suntail, which leave nothing to be desired. Absolutely trendy and up-to-date you are with our shed pattern bikini. This fascinates with detailed design and a figurative cut. Immerse yourself in the world of the Mermaids and be enchanted by our bikinis. Mermaids are fabulous beings, half the body of women, half fish bodies, which fascinate and fascinate us. They move elegantly through the water, are connected to the sea, can be carried by the waves and always look beautiful. Their swimming movements are elegant and weightless. The fish seem to dance and accompany you. Become part of this fantastic underwater world. Dive into the water and make the mermaid competition. With our bikini in the shed design you will find the perfect choice. We offer chic sequins with a beautiful pattern. Unique and special. 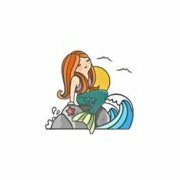 If you do not only want to look fashionably chic, but also want to experience the true mermaid, you will find in our online shop the matching mermaid costume for your bikini. Feel like Arielle, the small mermaid, and become a part of the underwater world. With a bikini and fishtail bottom, you can move as elegantly and gracefully as a dolphin through the water. They are not just a swimmer in the water, but become one with the wet element. An unforgettable experience. The suntail bikini in the shed pattern is available in different color variations. For every taste is the right thing. Or simply combine your bikini with a different colored mermaid skirt. You do not want to be completely transformed into a mermaid, but just enjoy your beach holiday? Even then our bikinis in the shed look are your first choice. The shed pattern is an absolute eyecatcher. Whether you want to prepare for the next bathing holiday or go under the mermaids, with our bikinis you always have the perfect beach attendant by your side. The size details help you to determine the tail size of the fish skin better. Please note that you buy the mermaid tail your size. The Suntail tail is very stretchy and must be close-fitting. If you are unsure about the size, we can help you by live chat, by phone, or just write us an e-mail.